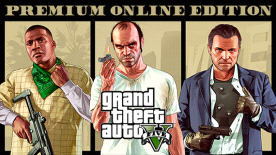 Purchase this bundle to get Grand Theft Auto V and the Criminal Enterprise Starter Pack. Please do not purchase this bundle if you already own the Criminal Enterprise Starter Pack. More details below. Rockstar Games, Inc. ©2008-17. Rockstar Games, Grand Theft Auto, GTA Five, Grand Theft Auto Online and R* are marks/logos/copyrights of Take-Two Interactive. All other marks and trademarks are properties of their respective owners. Dolby and the double-D symbols are trademarks of Dolby Laboratories. Uses Bink Video. Copyright © 1997-2012 by RAD Game Tools, Inc. euphoria motion synthesis technology provided by NaturalMotion. euphoria code is (c) NaturalMotion 2008. ""NaturalMotion"", ""euphoria"" and the NaturalMotion and euphoria logos are trademarks of NaturalMotion. Used under license. This software product includes Autodesk® Scaleform® software, © 2013 Autodesk, Inc. All other marks and trademarks are properties of their respective owners. All rights reserved. Add-on content, Grand Theft Auto V required to play. This content is only accessible in Grand Theft Auto Online, will be marked FREE in-game, and has no trade-in value, including vehicles. After installation, start GTA Online and follow the instructions to claim your items from in-game stores and websites.